a titanium-iron oxide mineral, in 1791.
and named the element after the Greek Titans, in 1795.
impure titanium metal, in 1825.
under high pressure in a steel cylinder, in 1910. Strong and light metal alloys. Each Boeing 747 has 45 metric tons of titanium. The Guggenheim Museum Bilbao is clad with titanium. Hip joint implants use titanium. Titanium powder or shavings can burn or explode. by water or carbon dioxide. at Creed, a hamlet in Cornwall, England. in the places where they happen? the feel of their origins. 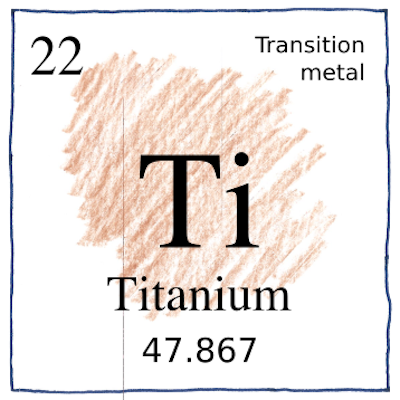 The Hunter process for producing titanium is inefficient non-scalable, so production of titanium was confined to the laboratory until William Justin Kroll, in 1940, invented a more complex but scalable process. For each element, I have tried to establish a place or region where the discovery was made, or, for the prehistorical elements, where earliest evidence of the element has been found. For me, the place is like the terroir of a good wine. But it is sad to see how those early origins have been lost.